I'm an avid Lushie and all that started when I received a Lush gift box for Christmas many moons ago. One of the first products I used was The Honey Bee bath bomb which is one of many favourites now. Unfortunately we don't have a bath in our cottage but I often find an excuse to go back to my family home so I can grab a Lush bath! 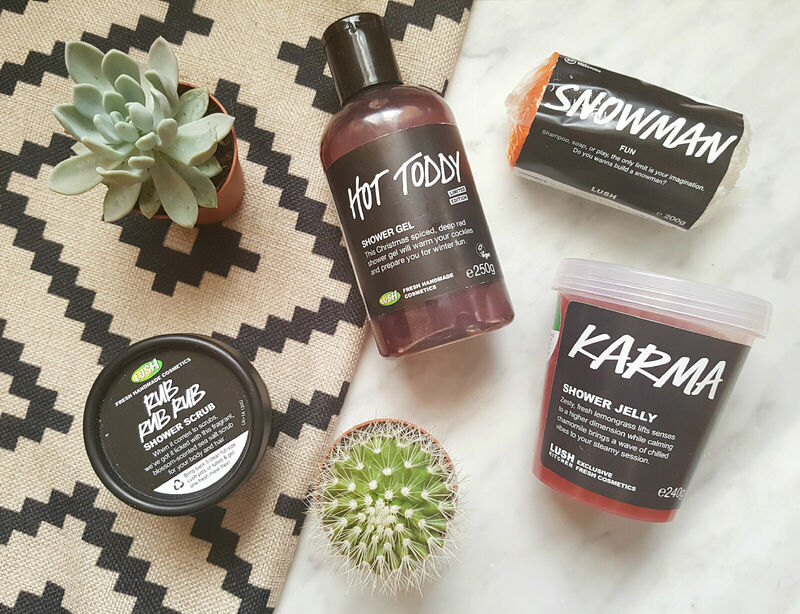 So let's talk about these wonderful Lush products and their beautiful scents. Hot Toddy - Not a product that is available everyday, can sometimes be picked up in the Lush Kitchen and available around Christmas time. If you love cinnamon as much as I do, you will die smelling this, seriously, it just smells exactly like Christmas. It even warms the skin when you use it. This is the only bottle I own and I'm holding onto it for dear life. Fingers crossed we will see it pop up this winter. Karma - Karma Shower Jelly is shown in the photo but this is not the only product Lush make that is Karma scented, they have many including perfume which I use regularly. I've had soooo many compliments from it and people seem surprised when I say it's from Lush (I guess some people think Lush just sell bath bombs). I can't begin to tell you HOW AMAZING THIS SCENT IS. Think meditating in a field, in summer, birds singing with the smell of incense burning. Seriously, it makes you feel like a hippie. Containing lavender, orange, lemongrass and patchouli oil, you kinda get why the product is called Karma, it really is one for relaxing. My favourite product in the Karma line is the Bubble Bar. If you haven't tried it, you haven't lived. Snowman - I went on a hunt when I had run out of the first Snowman fun I bought for Christmas and found a local lady selling one, don't know what I would have done without it. Snowman fun shares its scent with other Lush products including Carrot Soap and Snowman shower jelly. I find it really hard to describe the smell other than a subtle sweetness. When you have a headache, sometimes you just want something subtle and this is perfect. Run a piece under the tap for subtle scent and bubbles in your bath. Rub Rub Rub - Think salty, orangey goodness! This really is the scent of summer for me and it's one of my favourite products. Containing sea salt, it works as a great shower exfoliant. Be careful if you have sensitive skin or broken skin as it can sting. I suffer from Eczema and when I have flare ups, I stay away from this because it is just too uncomfortable for me, although I can imagine it would actually benefit my skin as sea salt is great for healing tool. This is just a selection of my favourite Lush scents, I would be hear all day to tell you them all. What are your favourite Lush products and Scents? I'd love to hear! I totally agree with you on Karma. It is my favourite! I remember around 10 years ago I got a gift set that was all karma scented products including a spray perfume. Love at first smell. I also really like Silky Underwear and Honey I Washed the Kids. Mmmmm!